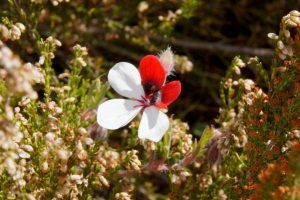 In order to find one of the most popular and extremely rare pelargoniums, P. tricolor we (my husband and I) travelled on the main road along the Atlantic coast toward Namibia. 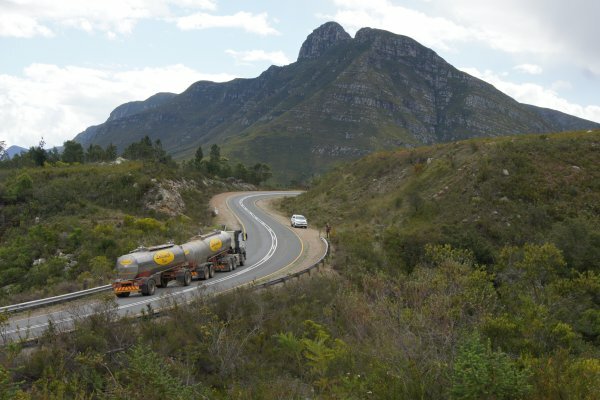 We had to turn off and make a big hook of 400 km inland, travelling to the southeast of South Africa in the direction of the Small Karoo (Klein Karoo). 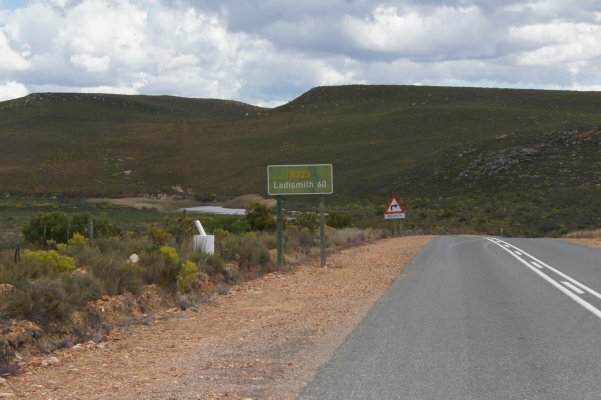 This elongated semi-arid region stretches from the town of Montagu (Montagu) through the village of Barrydale to the towns of Calitzdorp, Oudtshoorn and Langkloof. 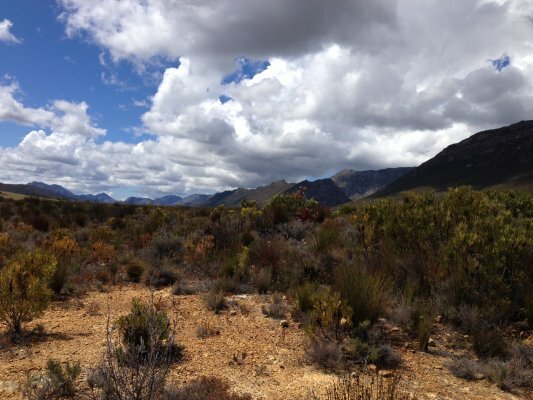 This region is known for its extremes when it comes to soil types and climate. 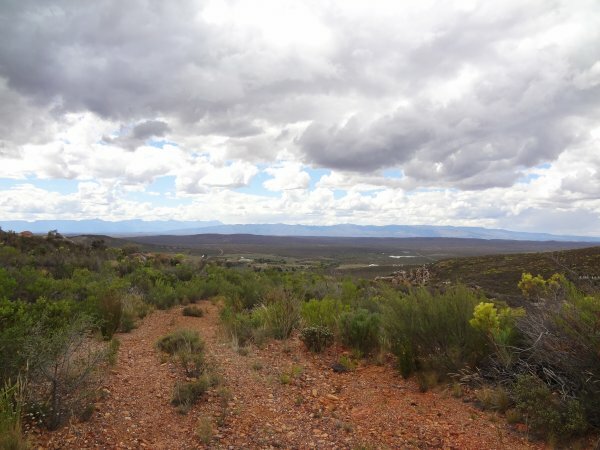 It is situated at the southern most part of the Karoo, approximately 30 kilometres from the Indian Ocean. 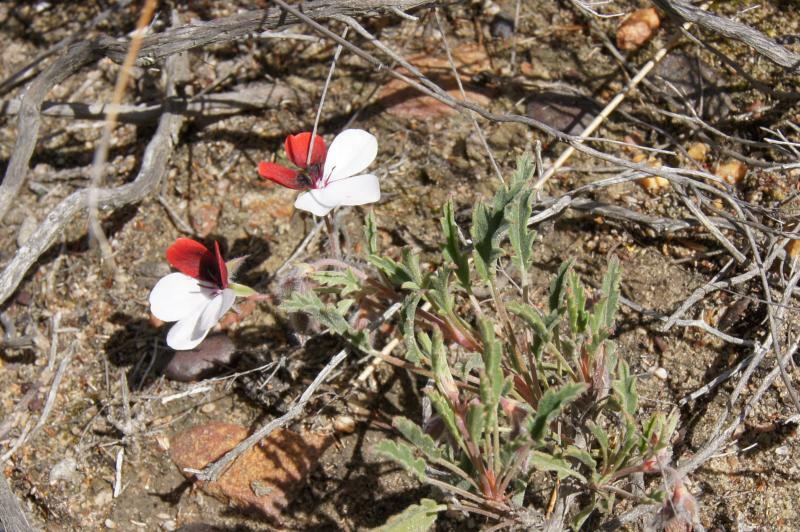 Finding P. tricolor in the wild is like finding a diamond in mining ore. It was my dream. 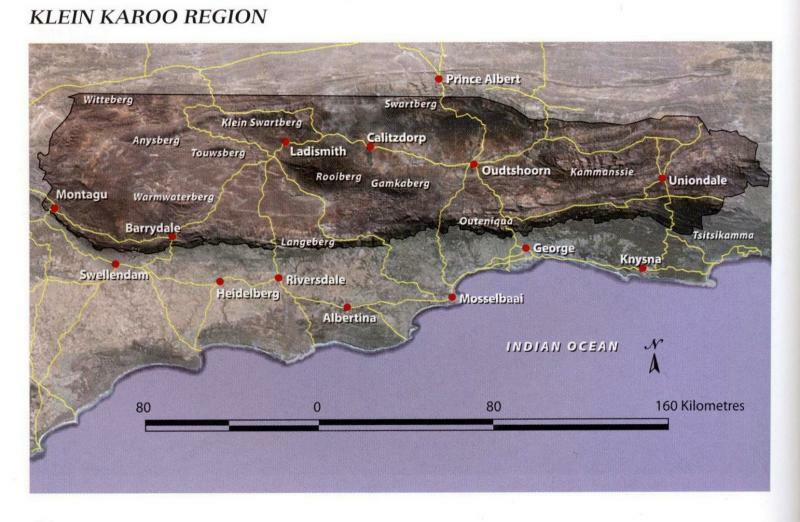 Of course, In preparation to search for this rare species, I studied maps of its geographical distribution range. It was necessary to know as precisely as possible its location so as not to lose a lot of time searching for it because we only had one day in which to find it. I was armed with the coordinates of all of the places posted on ISpot where people had previously found it. Although this was not very much information it made our search task easier. 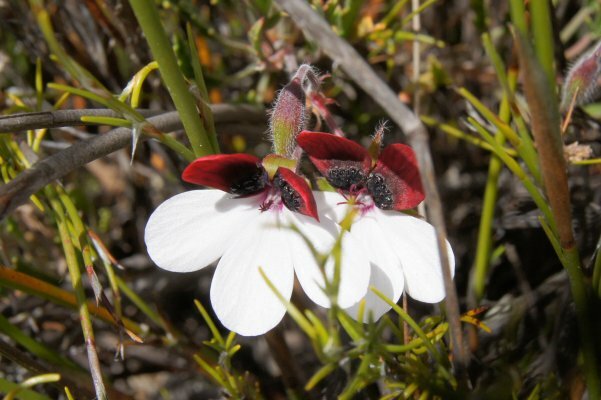 Looking out of the car window over the local landscape I had many doubts whether we would find P. tricolor in this area. 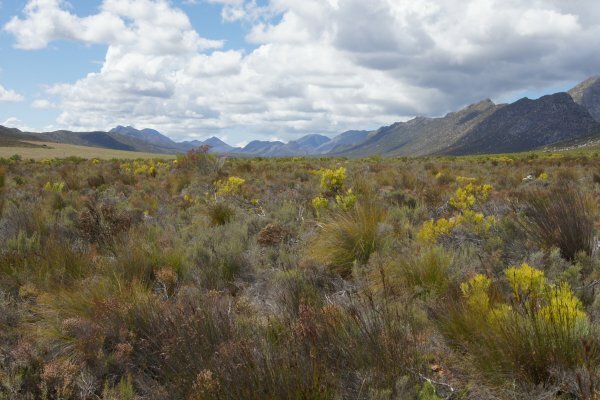 The vegetation consisted of waist high tussocks of grass, large shrubs, grasslands for grazing cattle and lots of road construction being done. I had imagined these places as more deserted, with sandy soils and sparse, low growing vegetation where there would be little evidence of human impact. 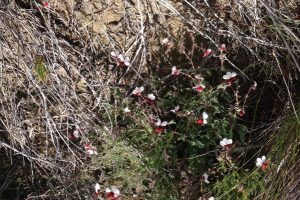 However what we found was, empty bottles, rusty cans, the remains of a tyre and even an old ragged boot… Where to look for P. tricolor, this small grassy semi-shrub, in such large area and among the waist high grass and the garbage? 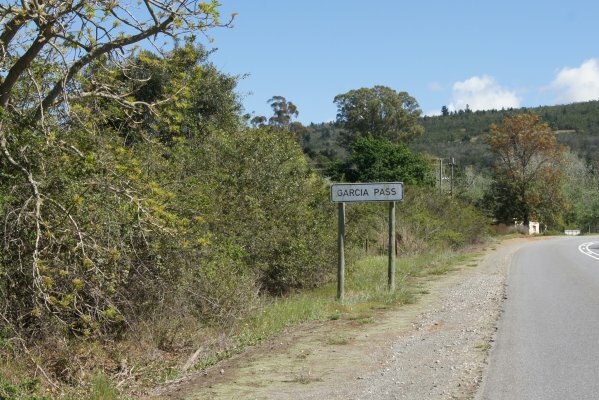 However, a blazing sun, bright blue sky and a fresh cool wind helped to ensure our optimism did not fade away, and, we were enjoying the fantastic landscapes as we moved along the pass. We made several stops, checking the known coordinates for P. tricolor at each location but we did not find it in any of these locations. At first I could not believe my eyes! However, it proved to be true. This was a precious P. tricolor! 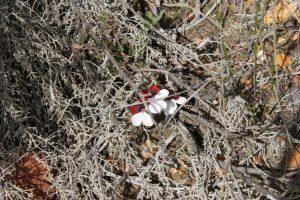 Because of the bright red and white colour of its petals the flowers were clearly visible among the dry dead branches in the grey withered grass. We intently searched every centimetre within a radius of three hundred metres from the place where we found it and only found a few other small colonies. 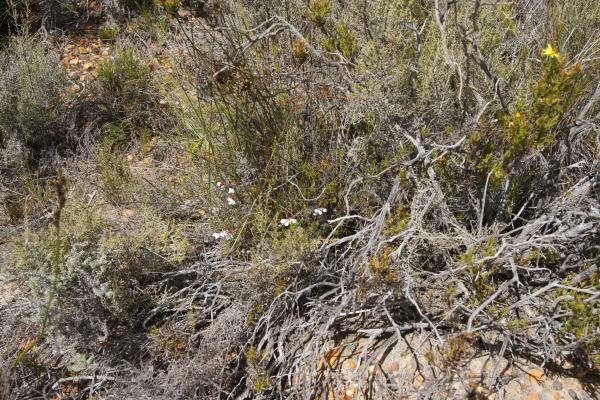 They were growing under large withered bushes and sometimes amongst dry branches, in the open fields and in sand heaps. All of these places were relatively difficult to access. 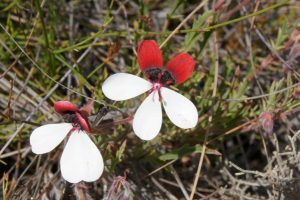 We were pleased to have found the red, “classic” tricolor, not the white form. Unfortunately, this was to be the only place that day where we found a rare plant. 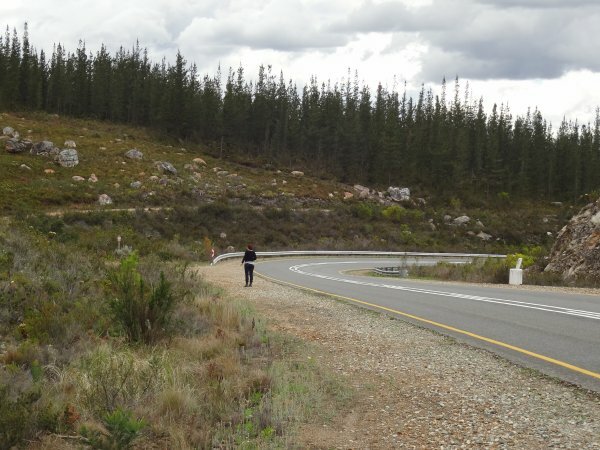 Further searches failed to find anything even though we reached the town of Ladysmith.